We operate 2 menus at Newsham. Menu 2 from September to February half term and then Menu 1 from February to July on a 3 weekly rota. To order a lunch we ask you to log on to Live Kitchen. Please supply your email address to the school office to receive a log on email in order to do this. 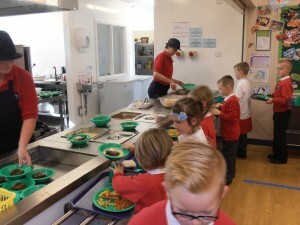 Pupils then check in at the kitchen hatch to receive the lunch they have ordered. You can preorder weeks in advance. Live Kitchen accepts all major cards or you can set up a direct debit. Lunches cost £2.30 per day. £11.50 per week.